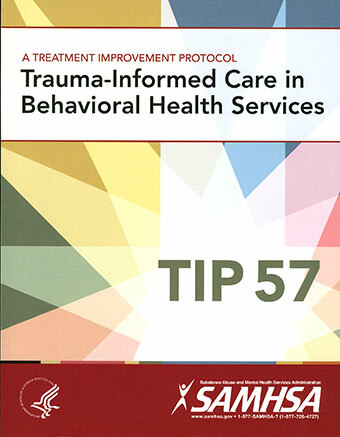 I am pleased to announce the publication of TIP 57: Trauma Informed Care in Behavioral Health Services by SAMHSA (Substance Abuse and Mental Health Services Administration). The Treatment Improvement Protocols (TIPs) are best practice guidelines for the treatment of substance abuse and behavioral health concerns. SAMHSA’s Office of Evaluation, Scientific Analysis, and Synthesis draws on the experience and knowledge of clinical, research, and administrative experts to produce the TIPs, which are distributed to a growing number of facilities and individuals across the country. I worked extensively on Part 2 of this TIP which focuses on building a trauma-informed workforce, counselor competencies, clinical supervision, ethics and clinician self-care. I am credited as a contributing author. This timely manual assists therapists, clinical social workers, substance abuse counselors and other allied health and behavioral health professionals to understand the impact and consequences for those who experience trauma. It provided an in-depth analysis of assessment, treatment planning strategies that support recovery, building a trauma-informed care workforce, and clinician self-care. Patricia Burke is a contributing author of this work. Substance Abuse and Mental Health Services Administration. (2014). Trauma-Informed Care in Behavioral Health Services. Treatment Improvement Protocol (TIP) Series 57. HHS Publication No. (SMA) 13-4801. Rockville, MD: Substance Abuse and Mental Health Services Administration. This event was posted in Announcements by Patricia Burke, MSW, LCSW, BCD.